NaNo day 30: The End? It is about to be midnight here on the east coast (some of you might have a couple hours yet). So, how did you do? Did you cross the finish line? I scratched out the last words I needed to finish NaNo, but my book is not yet finished (very few genres accept 50k word books) so there is writing left to be done. Unfortunately, this shiny now has to take a complete backseat for revisions and contracted books, but I do plan to continue working on it in my spare time. How about you? Did the NaNo goal allow you to finish your first draft, or are there words left to be written before you reach the magical words "the end"? 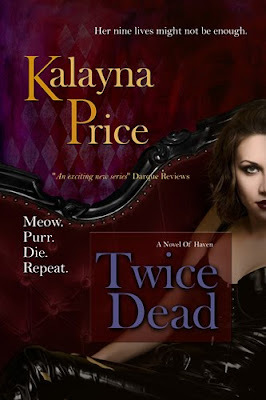 I'm thrilled to say that I have received permission to release the cover art for TWICE DEAD, book two in the Haven Series. I think my publisher did an amazing job with this cover, so I hope you like it just as much. TWICE DEAD will be released in late February, so look for more updates soon! NaNo day 29: Did you see the size of those ninjas? Okay, I admit it, the title of this post has practically nothing to do with the content. A friend tweeted the saying to another Wrimo who is pushing toward the finish line, and it made me chuckle and think about how zany first drafts can be. Have you noticed this month that sometimes, when you maybe have no idea what should be happening next and you just need something to happen, a plot ninja (meaning something totally unexpected and probably a little out there) sneaks on the page? And yeah, you might cut that craziness in the second draft, but maybe it leads you on a cool new path you would have never considered without the weird ninja. I've detailed my pre-plotting routine, and I am very much a plotter, but I have to tell you, I do love when a plot ninja shows up and gives me a new twist to work with. Anyone finding an abundance of plot ninjas? Any really interesting plot ninjas? We are hours from Thanksgiving, (officially--sleep still needs to happen. LOL) and while I sometimes forget and mark the day down as a scary'food holiday', it really isn't. It is a day to remember our blessings and give thanks. So, I just wanted to say thank you to everyone out there reading this blog. A lot of amazing things have happened this year, and I've been thrilled to be able to share them with you. Thanks for stopping by and sharing this bit of the net with me. 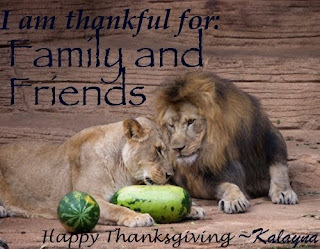 I hope you are well blessed, have safe travels if you are visiting, and have a wonderful holiday! I bet a couple of you Wrimos are so near the finish line that you can taste it. (Or maybe you crossed it already?) Let's see those word counts! I like pirates. The fictional kind. You know, big hats, swords, and a penchant for rum. I really like sky pirates in their clockwork ships. I don’t like internet pirates. Not at all. They make me sad. Google alerted me this morning that someone made a copy of OB available for download. It was suggested that I should feel flattered that someone liked my book enough to give it away. I don’t feel flattered. I want to cry. On average, authors make 8% of the cover price from books (that means, on your average 7.99 mass market book the author makes about 64 cent) but they make 0% on pirated downloads. Everything comes down to numbers in publishing, so not only do pirated downloads affect an author’s bottom line, but they can actually jeopardize her ability to convince publishers to purchase future books from her. Which translates to no sequels, and the author possibly having to use a pseudonym to sell another series. NaNo Day 22: Pay to play? No Way! There has been a lot of internet chatter recently about a certain big press, Self-Publishing, and Vanity Publishing. I'm not going to go on a tirade here because other people have said it better, but I am going to hit the high points. So lets talk business. Money should always flow toward the author. Be wary of anyone who refers you to a service. Do your research before you start querying. Okay, I'll expand on each of those points in a moment, but first I guess I should explain why I'm thinking about this today. Earlier in the week, Harlequin announced their new vanity publishing venture. Romance Writers of America, Science Fiction and Fantasy Writers of America, and Mystery Writers of America (probably the three largest and most influential writing organizations in the US) took a stand against Harlequin, and basically told them that if Harlequin was going to pee in the sand box, they weren't invited to play anymore. NaNo day 21: Boring scenes? And FIRE! I’m going to answer questions today, but first I want to talk a bit about, well, today. Today was a day of hard won words. The muse clearly gave me the finger and went her own way this morning. After a couple hours in front of the computer with a diminishing word count (I know, I know--no deleting in NaNo. Do as I say not as I do.) I decided it was time to switch things up, change the routine. It is amazing how freeing it can be to do that. To step away from the pressure of the keyboard and write long hand for a while. It helped. A lot. Unfortunately, I haven't had time to transcribe the words into the computer yet, so I haven't a clue my current word count. So how was your day 19? We are about to be 2/3rds through the challenge. How is your story coming? Loving it? Hating it? Have you gotten stuck? Tried changing your routine, write somewhere else or with something else? Did it help? Let's see those word counts! Cher asked: What process to you go through during the writing of a novel? Also, something that keeps popping up is the use of scenes and sequels. I'm a little confused about the differences. I understand the functions but when I look at other's writing I can't point out which is which. Any suggestions or examples? Hey guys. No questions answered in this post. No impressive word count either--most of my gained words are from yesterday. Most, but not all. Today I must admit to being sick. The coughing-headache-fever kind of sick. Thank goodness for laptops. I did get a few words in today. Mostly I've been watching Buffy and sleeping. Fun. 22759 / 50000 words. 46% done! I hope the rest of you are doing better than me. So how are those word counts coming? Good night everyone! Hey gang! Sorry I missed a couple days there. Go ahead and post your word count here, and I’ll add your name in the drawing for the days I didn’t post as well. So, I asked for questions, and I’m very pleased to have received quite a few. I’ll answer them all in the next couple posts, so don’t worry if I don’t get to yours today. I've been trying very hard to keep my daily NaNo blogs short but interesting. I'm accomplishing the first, but I'm not too sure about the second, and I doubt very much they are useful to you guys. So, I think that means this is a good time to open the floor for questions. Anyone have questions for me? Maybe a writing topic you'd like me to blog about? Something about my process? About the publishing world? About my books in particular or the genre in general? Now's the time, let's hear those questions! NaNo, the one third mark. It is day 10 of NaNo and this marks the 1/3 point of the challenge. I covered a lot of ground today, and I'm very happy with my story progress, but, my word count is a little short of the one-third mark. Tomorrow will be my day, I can feel it. The plot is starting to come together now. 14091 / 50000 words. 28% done! In other news, look what I found today: I'm on the RavenCon website! Of course, I've known I'll be a guest for a couple months now, but this is the first time I've seen my guest link. Very cool. If you will be in the Richmond, Virginia, area between April 9 - 11, you should definitely come out and see me. So how are you doing? Several of you passed the 1/3rd mark days ago *huge cheers for you! * Others should be right on track to be hitting it tonight, and a couple, like me are dragging a little behind (don't worry, we'll catch up!) So, let's see those word counts! Chugging along. Definitely not crossing the 15k mark tonight, but I'm not unhappy with the words I wrote. 11522 / 50000 words. 23% done! Let's see those wordcounts. Anyone learn anything new and fascinating today? Week one of NaNo is now behind us. While I decided I hated my shiny yesterday, I am once again very much in love with it. I am still plotting and fleshing out characters, but things are falling into place. I'm behind, no more than yesterday, but not significantly less either. I'll have to work on that. In the mean time, I'm happy it is shiny to me again, and I am looking forward to working on it again tomorrow. I'm not sure if it was the plotting, or the fact I spent a little time out of my head read someone else's work, but I see the potential again. Do you fall in and out of love with your words? How do you renew their vigor and gleam? 10017 / 50000 words. 20% done! Today was my very last day at the day job. It was a hectic one as I ran around trying to anticipate any issues I could preemptively fix, but now it is over. I had a lot of friends I'll miss and I hope to keep contact with. The department threw me an amazing farewell party, and my boss said the sweetest speech. I guess it was kind of like having a funeral--people say all the good stuff--but I was alive to hear it. In the mean time, I'm entering a contest the brilliant Faith Hunter is hosting, and I'm trying to decide which picture to use. What do you think? I hope you are all finding good words today! Write on! It has been a crazy busy day. At work I'm wrapping up everything I can and preparing things to be taken over by the new 'me' (whoever that turns out to be) so I ran around in crisis mode most the day, just trying to keep up. There were errands to take care of at lunch, so I lost my extremely important writing hour. Luckily, there was a write in tonight, and I pumped out some much needed words. I would really like to be building a bit of a cushion right now so that I'm ahead when my revision notes hit, but currently, I'm just scrapping by with the minimum daily word count. I can deal with that. NaNo Day 3: It's a plot! It's day three of NaNo, I'm almost 10% of the way through my word count, and I have now, finally, discovered my plot! Obviously it is sill early in the day and there are many more productive writing hours to come, but I'll go ahead and splash up my word meter. 4476 / 50000 words. 9% done! I have hooping tonight. Then I will buckle back in and take this shiny new plot idea for a ride. How is day three treating everyone else? Anyone discover something new about their story today? Day one of NaNoWriMo is finally here and the writing has started! We hosted our first write-in in my region this afternoon, and I have clocked my first 1700 words. The thing is, they are words in the wrong book. Yup, you heard that right. Wrong book. I had a plan. I had a plot. I even had a logical reason I needed to write what I'd intended. That all went out the window when I opened my laptop today.